Former Ole Miss quarterback Shea Patterson penned a nine-page letter in which he claimed the Rebels coaching staff routinely lied to him to keep him on campus, according to CBS Sports, which reviewed a copy of the letter. Patterson transferred to Michigan this past winter, but the move comes after what is described as 20 months of lying and misdirection from since-fired Ole Miss head coach Hugh Freeze and the Rebels athletics administration. CBS Sports reports that the letter sets a firm timeline of events that show Freeze and Ole Miss athletic director Ross Bjork were dishonest with Patterson about the scope of NCAA violations committed by the coaches—the Rebels are currently serving a two-year postseason ban for a series of violations related to some under-the-table payments made to players by Ole Miss boosters. Patterson claims in the letter that Freeze and Bjork led him and other players to believe that the majority of the violations were committed under the previous Ole Miss head coach’s reign. The Rebels athletic administration tried to pull the same stunt with journalists as the NCAA hawks were circling, only to have the coach they tried to dump the violations on, Houston Nutt, savage the program so badly that Freeze was forced to resign when it was revealed he was routinely dialing up escorts on his recruiting visits. Now, Patterson, being blocked from continuing his career and having already lost a season to the Ole Miss shitshow, is looking to show he, too, was a victim of a lying Rebels front office. 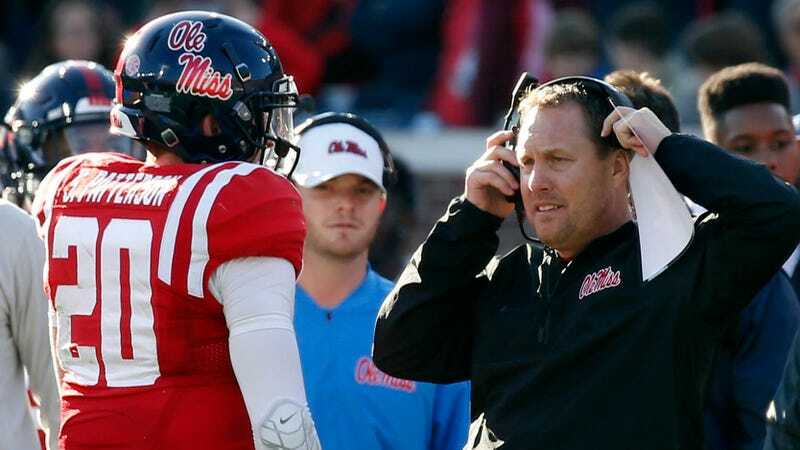 CBS Sports did not publish the letter; it also did not publish any of the details regarding Freeze’s behavior—otherwise known as the good stuff—as part of an agreement with Patterson. The site writes that it did so “due to the sensitivity of the ongoing case,” as Patterson is currently in the final leg of filing an appeal with the NCAA to allow him to be immediately eligible to play at Michigan. Transfer athletes that are not granted a waiver by the NCAA have to sit out a full season before they’re eligible. The move to let CBS Sports review the letter by Patterson came after Ole Miss formally opposed his transfer waiver appeal. According to CBS Sports, five other Ole Miss players seeking transfers are expected to file similar claims in the near future.